When it comes to high-end computer cases, Cooler Master has certainly risen to the occasion in recent years as a strong choice for enthusiasts. With top quality construction, unique features, and outstanding designs, it's not surprising to see them win that sort of mindshare with consumers. Last year, they really lured me in with the introduction of their "Cosmos" case during the COMPUTEX 2007 show in Taiwan. 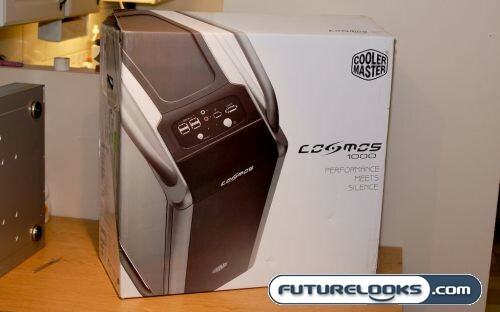 With the "Cosmos 1000" now readily available, Cooler Master has made a lot of drooling enthusiasts happy, including this one. Although I've had my review sample for a couple months now, I didn't want to sign off on it too early as a winner. Now that the Honeymoon is over, I'm finally able to be a little more objective in my opinion of this truly unique chassis. On with the show! The mainly steel construction of the chassis gives the case a net weight of over 16.9 kg's. This is without any parts inside the chassis. You're definitely not going to want to carry this case around with you to those LAN Parties, though on the bright side, you might end up with a great workout. It's also rather enormous, so if your desk has short legs, you might have to relocate with this chassis. Side removable VGA cooling tunnel to advance thermal airflow. Tool-free design for opening side panel conveniently. As you can see, it's a pretty impressive laundry list of selling features, leaving me particularly curious about it's quiet computing properties, while maintaing thermal performance. With a large number of fans and a GPU specific solution designed into the Cosmos 1000, we expect it to do both equally well. I'm also curious about the exectution of the cable management and tool-free capabilities once we get into the build.